Originally formed as No 10 (Naval) Squadron, RNAS at St Pol on 12 February 1917 as a scout unit tasked with escorting RNAS bomber and reconnaissance aircraft. In may its various Nieuports were replaced by Sopwith Triplanes and at the same time it was sent to the Western Front to assist the RFC. During this period ones of its pilots was Raymond Collishaw, who would become the third highest scoring Allied fighter pilot of the war. In August 1917, the squadron received Camels and in October returned to its coastal defence duties. However, the German offensive of March 1918, resulted in the unit being sent back to the Western Front to help bolster the defences and during these action on 1 April 1918, it was absorbed into the newly formed RAF and renumbered as No 210 Squadron. In July 1918 it once again returned to the coast but rejoined the fighting on the Western Front for the last few weeks. It remained on the continent until February 1919, when it returned to Scopwick, disbanding there on 24 June 1919. It reformed as a torpedo-bomber unit at Gosport on 1 February 1920, equipped with the Sopwith Cuckoo, but this was short lived, the squadron disbanding on 1 April 1923. It next reformed at Felixstowe on 1 March 1931 as a flying boat unit equipped with Southampton IIs. A move to a new permanent base came in June, when it arrived at Pembroke Dock, which was still under construction at the time. It re-equipped with Rangoons in August 1935, which it took to Gibraltar during the Abyssinian crisis returning to Wales in August 1936. On its return it re-equipped yet again, this time with Singapores. It also became involved in the Spanish Civil War, when it was detached to Algeria to protect neutral shipping from being attacked by submarines of the warring factions. Sunderlands arrived in June 1938. On the outbreak of war the squadron was immediately involved in patrolling the Irish Sea and with detachments at Invergordon and Sullom Voe, the North Sea to the Norwegian coast. The squadron re-located its headquarters in July 1940, when it moved to Oban and began conversion to Catalinas. From October 1942, the squadron was back at Pembroke Dock with a detachment at Gibraltar covering the North African landings. The squadron moved to Hamworthy in April 1943, whilst the detachment at Gibraltar remained there , however, on 31 December the detachment was transferred to No 202 Squadron and the squadron HQ was disbanded. The squadron was reformed on 1 January 1944 by renumbering No 190 Squadron at Sullom Voe in the Shetlands, where it continued to operate until the end of the war, disbanding on 4 June 1945. During this period one of its pilots, Flying Officer John Cruickshank carried out a daring attack on a German U-boat and despite severe injuries, managed to fly his aircraft home and waiting until daybreak was able to land it safely saving his crew, an achievement for which he was awarded the Victoria Cross. The squadron was reformed once again on 1 June 1946, when No 179Y Squadron at St Eval was renumbered. It was now operating as a land based maritime reconnaissance unit equipped with Lancasters. From 15 February 1949 until 13 January 1952, the squadron had No 217 Squadron linked to it in October 1952 it moved to Topcliffe, where it re-equipped with Neptunes in February 1953, disbanding again on 31 January 1953. 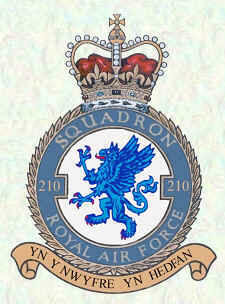 It was soon reforming again, when No 269 Squadron at Ballykelly was renumbered on 1 December 1958. Equipped with the Shackleton MR Mk 2, it moved to Sharjah in the Persian Gulf in November 1970 but a year later disbanded on 15 November 1971. Victory Fighters is largely a collection of eye-witness accounts of the struggle that raged in the skies over occupied Europe after the Battle of Britain. Reg Baker is one of the six featured pilots. Stephen Darlow has been a major support and contributor to this website do please visit the website of this excellent Military Aviation author.